Neck pain is quite common in US adults. It’s been estimated that around 15% of all Americans will experience neck pain or stiffness for at least 1 full day each year. This pain can range from mild stiffness and soreness, to a total inability to turn or move the neck.Often, chiropractic adjustment is the best way to cure this problem. 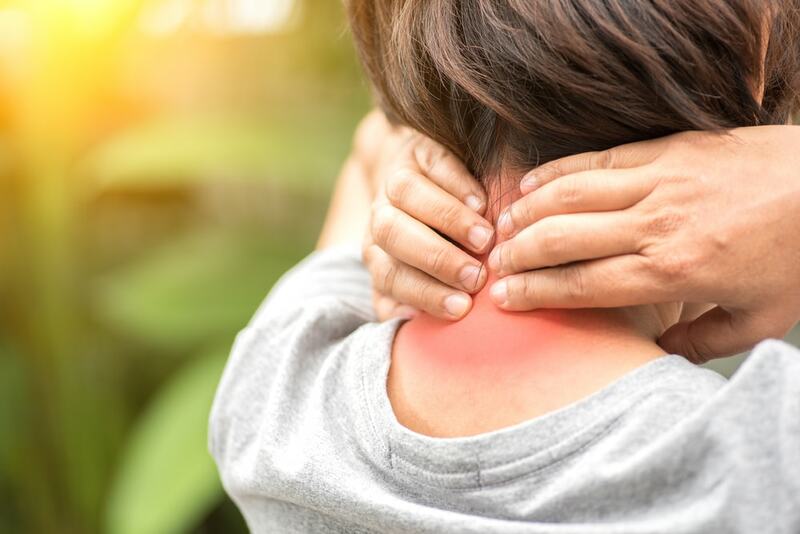 But first, let’s understand the common causes of severe neck pain, and take a look at a few simple exercises that may help relieve neck pain. Whiplash – Whiplash occurs when the neck and head are forced backward and then forward suddenly. This can have a devastating effect on the cervical spine, and cause severe neck pain. Whiplash is most commonly caused by auto accidents, but can also result from sudden falls, impact injuries, or heavy hits in contact sports like football, hockey, or soccer. “Text Neck” – Poor posture can often lead to what’s known as “text neck” when using mobile devices. The use of mobile devices causes us to look down for extended periods of time, which puts a tremendous amount of stress on the neck. Poor Ergonomics At Work – If you work a desk job, you’re likely staring at a computer screen for over 8 hours a day. Failing to implement proper ergonomic best practices such as proper chair and monitor height/angle can result in a significant amount of neck pain. It can also lead to sciatica pain. Sleeping Incorrectly – Everyone has gone through this at some point. You “sleep funny” on your neck, resulting in serious and significant neck pain. This happens when you sleep without proper support for your neck. If your spine is misaligned during sleep, the muscles in your neck will be strained, resulting in aches and pain. While neck pain can be caused by dozens of different issues, these are by far the most common culprits. Note: These exercises are not a substitute for diagnosis and treatment by a qualified medical professional. If you are experiencing severe neck pain, tingling, or numbness, seek medical attention IMMEDIATELY. The chin tuck is easy, and can be done anywhere, making it a great exercise for relieving neck pain. Sit comfortably and stare straight ahead. Locate an object that you can “sight” during the exercise. Move your chin towards your chest while maintaining eye contact with the object you’re “sighting”. You’ll feel a slight, comfortable stretch from the neck to the base of the skull. Once your chin contacts your chest, hold for 5 seconds. Release. Rest for several seconds. Repeat 5-10 times, as desired. The seated neck release is a good way to relieve tension on the sides of your neck. Sit comfortably, either on a chair with your feet on the ground, or cross-legged. Place your left hand on the top of your head. Slowly tilt your head to the left. Gently stretch your neck by applying pressure with your left hand. Hold this position for up to 30 seconds, then slowly lift your head to a neutral position. Repeat this stretch on the other side of the neck. This stretch helps your cervical collar relax, unlocking your shoulder girdle, and allowing your neck to stretch gently. Begin on all fours. Align your wrists under your shoulders, and your knees under your hips. “Walk” your hands forward, approximately 6 inches. Shift your body forward accordingly. Keep your elbows “locked out”, but allow your shoulder blades to relax and collapse together. Now, simply let your head “hang”. This is very important, as your neck will be able to truly relax and “release” from the tension it’s always under. Relax your stomach and allow your back to arch naturally. Breathe slowly and naturally. Hold for 2 minutes. Don’t let your elbows bend. This exercise relieves the tension your neck is under, and helps relieve pain caused by muscle strain. SYMPTOMS NOT IMPROVING? COME TO INTERO CHIROPRACTIC! Intero Chiropractic, in Pleasanton, CA, is the #1 choice for neck pain in the region! We offer professional adjustments from our 3 qualified doctors, and we focus on making you comfortable during your appointments, and restoring you to a normal, pain-free life! Our patient testimonials speak for themselves – we’re the best in the business! So schedule your appointment today online, or give us a call at (925) 255-5805. We’d be happy to hear from you, and learn how we can help you with expert chiropractic services.